Melted Body Butter Base with Empowering 7X Bronzer. 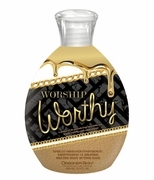 7X Bronzer features a generous blend of instant and delayed bronzing agents. Melted Body Butter Base melts onto skin with a light feel and long lasting protection. A light Silicone Blend leaves skin soft and smooth – never greasy.